Affect and emotion have come to dominate discourse on social and political life in the mobile and networked societies of the early 21st century. This volume introduces a unique collection of essential concepts for theorizing and empirically investigating societies as Affective Societies. The concepts promote insights into the affective foundations of social coexistence and are indispensable to comprehend the many areas of conflict linked to emotion such as migration, political populism, or local and global inequalities. Adhering to an instructive narrative, Affective Societies provides historical orientation; detailed explication of the concept in question, clear-cut research examples, and an outlook at the end of each chapter. Presenting interdisciplinary research from scholars within the Collaborative Research Center "Affective Societies,"this insightful monograph will appeal to students and researchers interested in fields such as affect and emotion, anthropology, cultural studies, and media studies. Jan Slaby is Professor of Philosophy of Mind at the Institute of Philosophy, Freie Universität Berlin, Germany. Christian von Scheve is Professor of Sociology at the Department of Political and Social Sciences, Freie Universität Berlin, Germany. 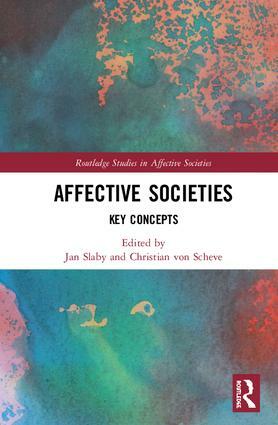 The Routledge Studies in Affective Societies book series presents high-level academic work on the social dimensions of human affectivity. It aims at shaping, consolidating and promoting a new understanding of societies as Affective Societies, accounting for the fundamental importance of affect and emotion for human coexistence in the mobile and networked worlds of the twenty-first century.